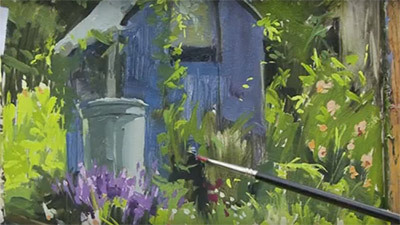 As ever, David Curtis is a joy to watch as he creates beautiful fluid paintings for his new DVD, Light and Mood in Watercolour. 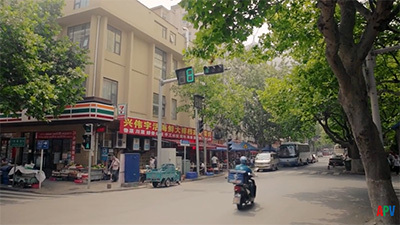 Working with a selection of urban and rural scenes, he paints mainly on location, providing insight into both technical matters and his own aesthetics. Starting in his native Yorkshire, he chooses a pastoral scene which poses the challenge of working in the cold, and with changing light, which encourages him to work swiftly. The second demonstration at Tick Hill, focusing on the river and church, makes us all the more aware of the weather as rain stops play part way through the painting, forcing a return trip to complete it. In total contrast, he then moves to the bustling cities of Paris and London. An atmospheric street in Montmartre, leading up to the Sacre-Coeur is a wonderful subject enlivened by figures and Parisian scooters, but here too, the damp atmosphere has its own problems, making drying times long. 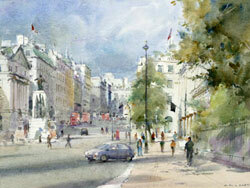 Lower Regent Street in London, familiar to those who frequent the Mall Gallery, depicts a warmer scene, bathed in October sunshine, defining clear shadows and necessitating decisions on how much detail to include. Finally, David works in his studio using a recent oil landscape for reference, demonstrating how different media can produce very different interpretations of the same subject. 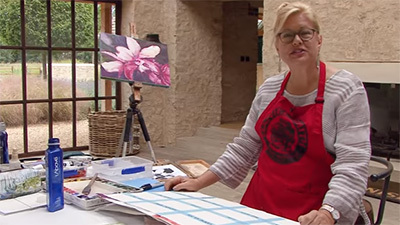 This film shows David Curtis doing what he does so well; painting watercolour in its purist form, without the addition of any mediums or body colour, and without recourse to photographic reference. 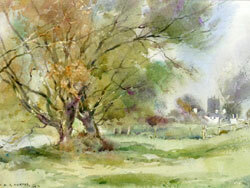 For those who have some experience of handling watercolour, it will provide guidance, ideas and inspiration. 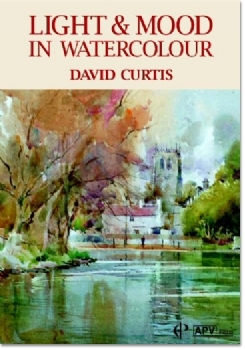 David Curtis is also a great advocate of plein air painting and he is well known, of course, for his love of pure watercolour in which the emphasis is on fluidity and transparency. 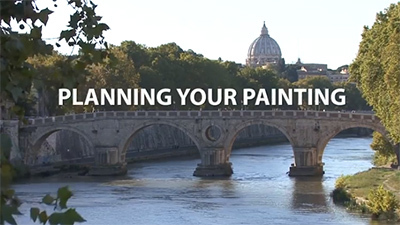 His latest film Light & Mood in Watercolour is packed with instruction and advice, as he generously shares with us his immense experience and understanding of the watercolour medium. 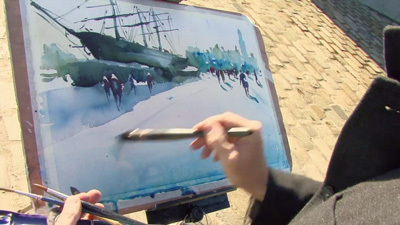 He shows us how to select, "to extract the drama, the joyous bits"; he encourages us to draw and establish a good sense of design and structure in the painting; and he demonstrates a wide range of techniques, including his distinctive 'ghost' wash. 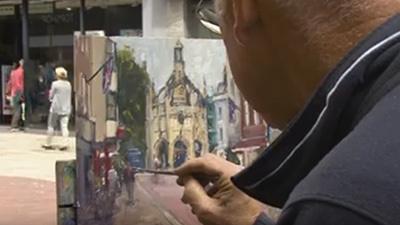 The demonstrations give us a true insight into the thrills and frustrations of painting on site and there is much to learn from watching a master at work. His subject matter is wide-ranging: an autumn landscape, a quiet village scene with a distant church (interrupted by rain!) 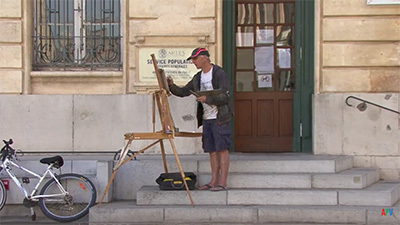 and subjects with "a feeling of buzz" in Montmartre and Lower Regent Street, as well as a studio demonstration that is developed from an oil sketch.